Give your customers the opportunity to call the waiter if they need something right away! No more unhappy customers endlessly waiting to be served! More turnover – Faster service means shorter customers’ waiting and consumption time, increasing income for your establishment. Enjoy more orders and efficiency, leading to more table turns. Our clients have reported an increase of approximately 18%! Reduce number of staff- Be able to handle larger areas with less staff. Improve waiters’ work efficiency and reduce number of persons needed. Quicker response times – Improve your waiting staff reaction times and never miss out on an order. Outside and hidden areas can be serviced instantly without the constant need for waiters to monitor. Improve customer service – In order to be served customers only need to press the calling button, without having to look for a waiter and then frustratingly having to try to catch their attention. Waiters can receive calling information promptly on their pager-watch and provide timely service without interruption. Customers are more relaxed and satisfied while the environment is quieter. Simplicity – Extremely simple to use, no wires and minimal running expenses. 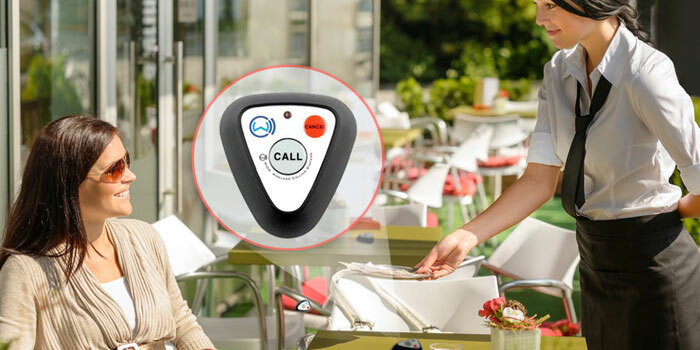 Waiters’ pager-watches can be programmed only to respond to calls from designated areas/tables, preventing more waiters responding to the same call.